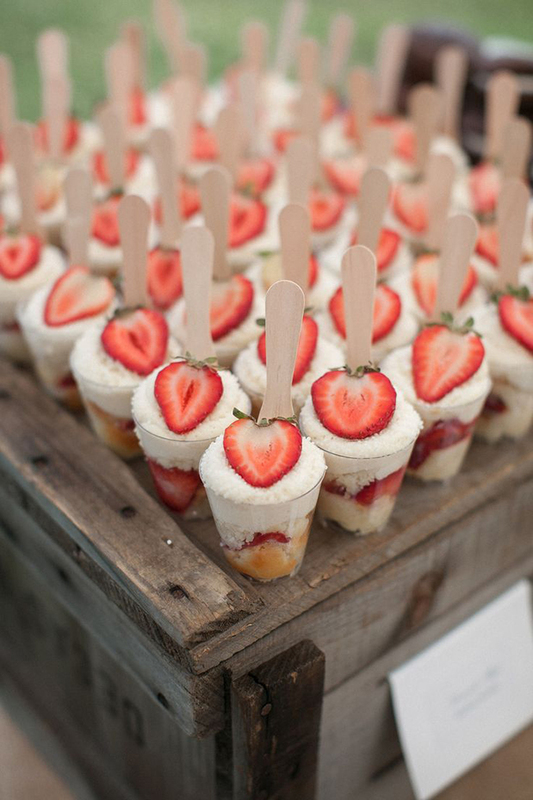 This rustic-yet-chic-and-perfect display of miniature strawberry shortcakes is from a beautiful wedding on Style Me Pretty. (Just look how all the strawberries area facing the same way, and every last one has leaves!) You wouldn’t need a caterer to copy this idea for a strawberry party, though – it’s quite simple considering how pretty it is. Shop for personalized Strawberry Party paper goods and printables here. Or, check out more Strawberry Party ideas on Pinterest or here on my blog! These are wonderful and I'm going to pin them for an end of the year sleepover for our small Girl Scout troop! Already trying to pull together the fun ideas. Are the cups little plastic shot glasses? Hi, Can you please tell me the recipe for this. Where is the recipe for the shortcakes. Hi Sue! There's no recipe, just a picture. You could use any shortcake recipe and just serve them like this. Hi Mari! There's no recipe, just gather the ingredients and layer them as shown in the picture. Looks amazing! Will make for my neice's grad party tomorrow. Hope it comes out as pretty as this picture!